Race relations post-Ferguson poll: Washington Post finds increased support for changes. 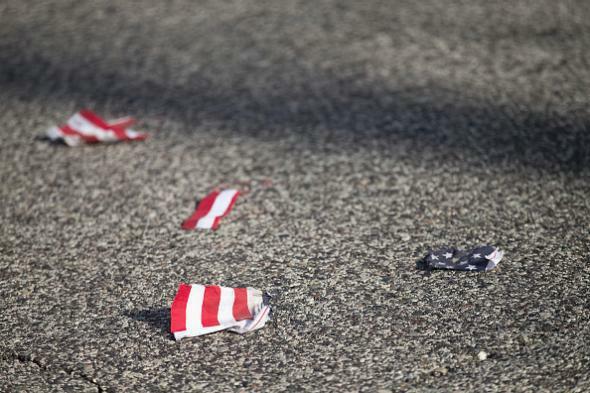 A flag torn apart by a protester outside the police station in Ferguson, Missouri, on March 15. The Post poll found 60 percent saying the nation needs to continue making changes to give blacks and whites equal rights, while 37 percent say those changes have already been made. The findings mark a shift from a 2014 Pew Research Center poll asking the same question. Back then, prior to Ferguson, 46 percent said more changes were needed to guarantee equal treatment. That view, the Post says, is now a majority belief not only among Americans as a whole but among 53 percent of white Americans specifically.